TCHG celebrates ultimate success as Kathleen wins National Intermediate Apprentice of the Year! Administration Apprentice, Kathleen Sandford, from The Community Housing Group (TCHG) in Kidderminster, Worcestershire has seized the top award at the 2015 National Apprenticeship Awards. After taking the title at the West Midlands regional awards in November 2015, Kathleen went through to the national awards finals. 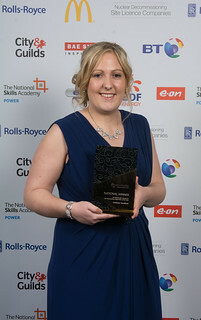 Held at the Grosvenor House Marriot Hotel, London, Kath came away with the National Intermediate Apprentice of the Year award. January has been an outstanding month for Kathleen, as she also received an exciting invitation from David Cameron, the Prime Minister, to attend No. 10 Downing Street as a guest to a drinks reception to celebrate Apprenticeships. The Community Housing Group Apprenticeship Programme also achieved success at the 2015 Awards, as for a third year running they were recognised as one of the UK’s Top 100 Apprenticeship Employers. The list is compiled annually by the National Apprenticeship Services and recognises excellence in businesses that employ apprentices. Youth unemployment is high within the Wyre Forest, as in other parts of the country, but through their subsidiary company, Vestia Community Trust, TCHG focuses their employment services to ensure that tenants and families benefit from targeted employability programmes. They help to improve skills, increase chances of gaining employment through Apprenticeships as well as future proofing the TCHG business model by increasing the number of working tenants and protect rental income streams. Embedding apprentices at TCHG has been achieved by adopting a planned workforce approach and through strong leadership from Directors who champion Apprenticeship recruitment. Building Apprenticeships into the Groups recruitment policy means they are part of a strategic approach to growing the business and developing the skills and workforce needed for the future. When a vacancy occurs managers automatically consider Apprenticeships as an option. Costs are measured through the Apprentice Return on Investment model. In 2014/15, the model demonstrated a year 1 saving of £12k and an expected increase in subsequent years as the productivity of the apprentice increases.